At the end of Tigiwon Road, the trailhead to Notch Mountain awaits. This view of the Mount of the Holy Cross, a 14er, is the view you'll get from the saddle at approximately 13,100'. The snow cross, seen here across the valley, was first photographed by William Jackson on August 23, 1873. 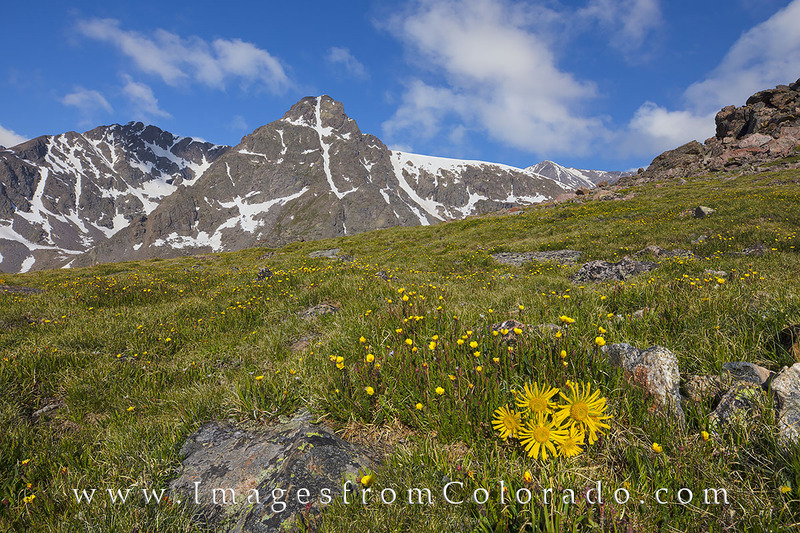 Small wildflowers, including Old Man of the Mountain seen here, fill the alpine tundra and make for a beautiful morning hike. The round trip for this summer trek was right at 11 miles and covered about 3,000 vertical feet. Behind me in this image is a shelter built in the 1930s. Photo © copyright by Rob Greebon.